Herring in classical marinade with added onions, crunchy pieces of carrots and spices, for example, cloves, black pepper and allspice. 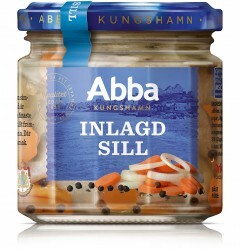 Herring in the jar is cut into nice pieces of fillet, without bones and skin. Product packaged in 0.32 l, 0.53 l, and 1.7 l jars. Expiration date: 10 months. 100 g of product contains: energetic value – 900 kJ (210 kcal); 22 g carbohydrates (from which 19 g sugar); 9.5 g proteins; 3.1 g salt; 9.5 g fat (from which: 2.5 g saturated fat acids; 5 g monounsaturated fat acids; 2 g polyunsaturated fat acids; 2 g Omega-3 fat acids; 1.5 g EPA+DHA from fish).